If you own a sailboat, then you know how big the rudder is, it's always bigger when you take it off the boat! We had to drop the rudder in order to fix the rudder bearings that cause a small amount of rudder wobble. While the boat was out of the water during the Survey, 31 months ago, the Surveyor commented that we had a bit of slop in the rudder but nothing serious. I decided to fix that during the next haul out (now). 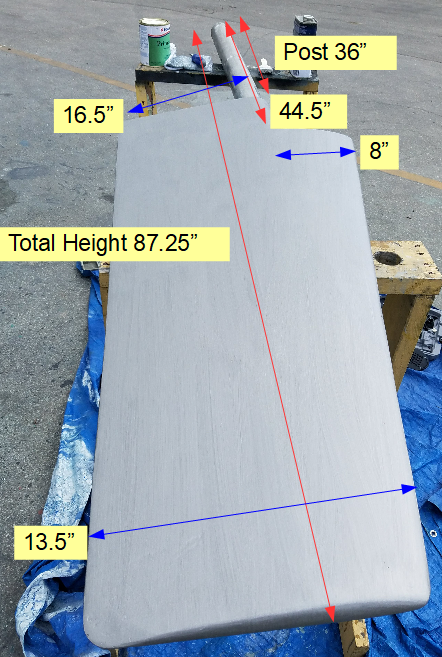 The Rudder is taller than the gap between the hull and the ground when the boat is on blocks, and I did not know the dimensions. 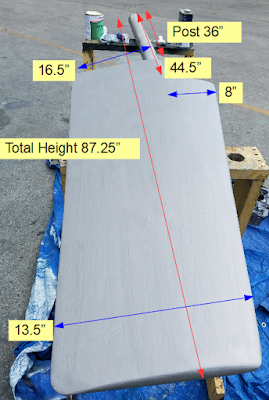 Here's the rudder dimensions. I'm guessing the rudder weighs about 50-60lbs it could be more if I'm boasting. 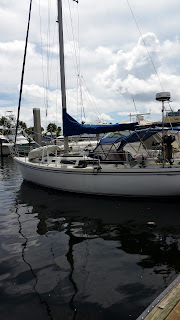 We had to have the boat yard leave the boat hanging in the crane straps while I freed the bolts that held the rudder in place, that took over an hour, but with the help of an impact driver I was able to get them out with a few minutes of hang time left. The pic shows the rudder after repairing the lower edge that was damaged during a recent grounding and after it's 1st of 3 coats of primer. Here are the rudder details. So, in order to drop the rudder, the Keel has to be 27.25” inches above the ground - or – about a 30” hole beneath the Rudder.